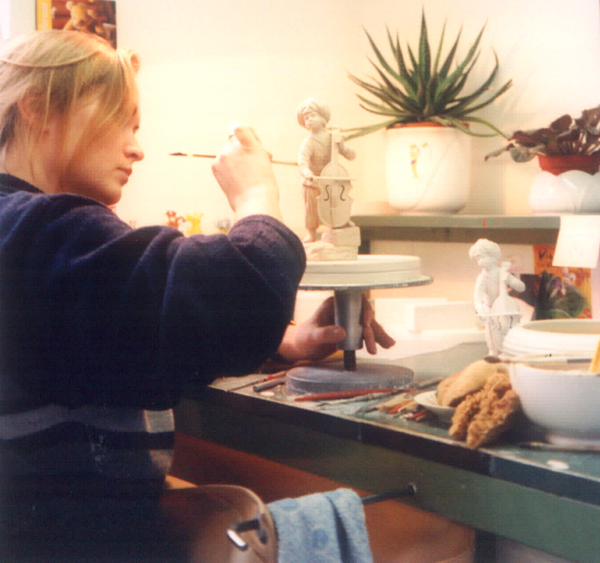 The 10 Golden Rules to reduce workers´ exposure to dust are an initiative from the German Fachausschuss Glas-Keramik (expert committee for the ceramics and glass industry, associated with VBG). More info at www.staub-info.de. Dust is a disperse distribution of solid substances in gases, particularly air, resulting from mechanical processes or from the swirling up of deposits. With this rather complicated definition a very specific type of hazardous substance is paraphrased which is accorded a particular significance in many branches of industry. In mining, quarries and tunnelling, in the use of dust or powder-like raw materials in the glass and ceramics industry, in metal foundries, in the manufacture and processing of building materials, in the mechanical machining of different raw and finished products, for example as a result of grinding, but also in maintenance and cleaning work in areas with a high accumulation of dust: in all these processes, fine and finest solid particles occur which are released into the air at the workplace and can therefore be inhaled by the people employed there. The health hazard caused by the inhalation of dust is however usually dramatically underestimated by employees and the responsible management staff in the plant. On the one hand dust is often only considered to be "annoying dirt", which from time to time needs to be swept away or disposed of - as long as one can still see one's hands in front of one's eyes, everything is ok.
On the other hand the matter of dust is old hat, the proverbial "hellholes" belong to the past at any rate, or maybe not? To be able to effectively confront such catastrophic prejudices and thereby facilitate an effective dust control, a deeper knowledge of the type and mode of action of the different types of dust is necessary. What dusts are there actually? As already defined, dust consists of fine, solid particles distributed in the air that are caused by mechanical machining (milling or surface machining) or by the swirling up of deposits (e.g. by blowing off dust with pressurised air or dry sweeping using a broom). Fumes count among dusts in the broad sense. They are formed as a result of chemical or thermal processes (e.g. welding) and also consist of fine solid particles distributed in the air. Fibre dust is a description of airborne particles made from inorganic or organic substances which have an elongated shape. Fibres which have a length of > 5 µm, a diameter of < 3 µm and exceed a length-diameter ratio of 3:1 play a particular role since only they can penetrate into the deeper respiratory passages. Dust entering the air at the workplace is inhaled when breathing and thereby reaches the different areas of the respiratory organs. Larger particles are already segregated in the upper air passages, i.e. in the nose and throat, while only the smaller particles reach the deeper respiratory passages, the alveolus or pulmonary alveoli. To assess the health hazard, therefore, in addition to the concentration of particles (dust mass per m³ breathable air in [mg/m³]) the particle size in particular is also of significance. Two size categories are thereby differentiated: the inhalable and the respirable fraction. Inhalable dust refers to the entire inhalable proportion of the dust through the mouth and nose. Repirable dust relates to the proportion of the respirable dust which can reach the pulmonary alveoli due to its small particle size (fig. 1 and 2). The individual hazardous substances can, in each case depending on how they originate, occur in entirely different particle fractions and be individually limited in these fractions via the occupational exposure limit (OEL) according to their toxic properties. The assessment of dust that is hazardous to health at the workplace therefore, in addition to the proportions of inhalable and respirable dust, also calls for the knowledge on the distribution of the hazardous substance within the individual fractions. A differentiation must be made according to particle size, shape and material composition (fig.3). Occupational exposure limits for different varieties of dust have so far been determined according to this principle for the inhalable or for the respirable dust fraction. Irrespective of this there are general upper limits for the inhalable and respirable fraction of dust without specific toxic effect. In the EU no binding OEL has so far been determined for inhalable and respirable dust. However, for inhalable dust a OEL of 10 mg/m³ applies in the majority of EU member states whereas the national values for respirable dust are in a range from 3 to 6 mg/m³. An overview of the internationally applicable OEL´s for dust can be found in www.dguv.de/ifa/de/gestis/limit_values/index.jsp (fig. 4). How do dusts enter the body and what effect do they have? Humans have a respiratory system with an effective self-clearance mechanism. This filter system copes with "normal grime" effortlessly and protects humans quite perfectly. However, it is not adequately designed for excessive stress as a result of dusts. An essential function in the self-clearance of the respiratory passages is played by the microscopically-small cilia which can be found inside the bronchia and their finer branches, the bronchioles. With continuous directed movements they transport the dust particles deposited in the bronchial mucus back to the upper respiratory tract where they can then be coughed up. As a result of inhaling large quantities of dust or of toxic dust, this clearance mechanism can be disrupted or at least be greatly impaired for a long time. The consequences are irritations or inflammations of the upper respiratory passages, increased mucous secretions and a tickly cough, bronchitis and inflammations of the bronchia and of the pulmonary tissue. In these cases, it is much easier for toxic, carcinogenic and allergenic dust particles such as, for example silica dust, heavy metal oxides, welding fumes, wood or flour dust, to deploy their harmful effect in the respiratory passages and in other organs of the body. Tobacco fumes particularly impair the clearance mechanism of the lungs. Smoking can lead to the destruction of the bronchial mucosa with the irreversible loss of cilia and adenocytes of the respiratory passages that form mucous. The transport of the mucous with the dust particles segregated in it out of the respiratory passages comes to a standstill. Smoking therefore is harmful not only as a result of the toxic substances in the tobacco smoke such as tar constituents, carbon monoxide, formaldehyde, benzene, heavy metals and nicotine. It also disables the self-clearance mechanism of the lungs and thereby multiplies the harmful effect of the inhaled dust. What regulations are there on dust protection? 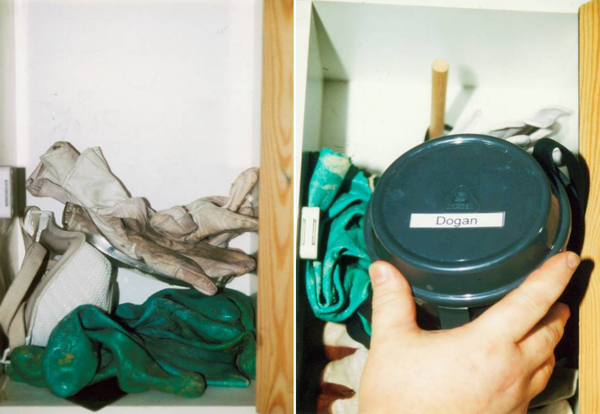 The fundamental approach for dust protection is determined in the Chemical Agents Directive 98/24/EC dated 7 April 1998. Accordingly it should be tested whether substances with a lower risk to health can be used (principle of substitution). However, silica as a raw material cannot be replaced in many branches of industry since silicon dioxide is the basic component for an entire series of mineral raw materials and products. Other frequently used hazardous dusts (e.g. lead oxide in glazes and engobes) can sometimes be replaced by other less harmful compounds. If hazardous substances cannot be substituted, protective measures are to be taken. The order of precedence of the protective measures is also defined in the Chemical Agents Directive. Work methods are to be designed in such a way that hazardous vapours and suspended particles are not released. Leaking of generated dust can be prevented, for example, by means of dust-tight systems or vacuum operation. The design of the working process is therefore to be reviewed. For example, the use of moistened raw materials can drastically reduce the production of dust. Another possibility is the use of raw material granulates with a corresponding lower tendency to dust formation. According to the current state of the art the release of dust is unavoidable in many production areas. For this reason capture must be as complete as possible already at the emission point or point of origin. There are already suitable extraction systems, for example, for ceramic presses, for bagging units for powdery substances or tools and systems for the machining of natural stone. The effectiveness of extraction systems must be supported with corresponding ventilation technology and adequate venting of the work areas. Substances which tend to produce dust must be immediately disposed of by suitable means (vacuum cleaners or sweeping vacuum machines with deduster) in the event of repair works. 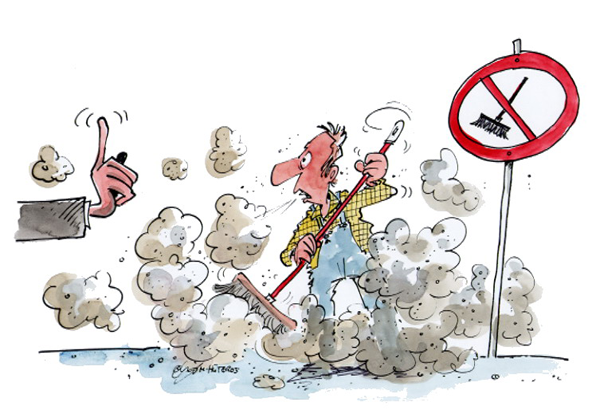 Brooms or even pressurised air are not suitable and are to be strictly banned from such areas! If the OEL´s, despite exploiting all technical and organisational protective measures, are not complied with, for example during maintenance and repair work, then personal protective measures are necessary, for example wearing dust masks. In any event employees must be trained in accordance with the Chemical Agents Directive about hazards and protective measures: the preparation of operating instructions and corresponding instruction by supervisors are compulsory. Further organisational measures in the event of dust exposure include the execution of specific occupational health check-ups or the minimisation of exposure by restricting the duration of stay of the employees (e.g. in a partially or fully-automated raw material dosing system). What is the situation in practice? The relatively extensive and thus general provisions of the Chemical Agents Directive 98/24/EC are further substantiated in the EU member states in national legislation. These regulations, however, often are not sufficient to solve urgent dust problems in operational practice. For this reason the Expert Committee for glass and ceramics have prepared "Ten golden rules for dust control", which should provide plants with a simple, clear and above all user-friendly guideline. These rules can be used by the responsible parties in the plant for the risk assessment, for training purposes and in daily work. If the rules are observed by the employees, they will achieve a major contribution to the reduction of dust exposure and thus improve the protection of health in the plants. "Good" dust is dust which is not produced in the first place and cannot reach breathable air. If dust particles are distributed as a result of swirling up of deposits, improper storage or as a result of being carried off with work equipment or work clothes, it is already too late! 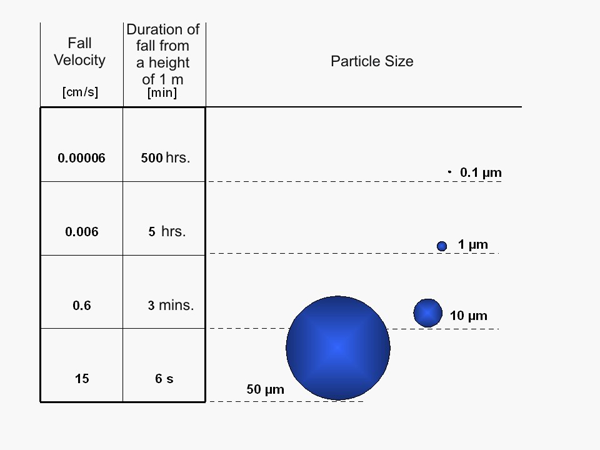 Fine, respirable dust particles have a diameter of 5 µm and less. They are so light that it could take several hours before they sediment on the floor or other surfaces (see fig. 1). In addition this fine dust-air mixture is virtually invisible to the human eye and thus elude our perception. It is therefore particularly important to make employees aware of the dangers and particulari-ties when dealing with dusty materials and in the occurrence of dust. Dust protection must begin as early as at the start of production! Dust can be produced even as a result of improper storage. Dust-releasing materials and raw materials can be carried over to other work areas. Preparation and storage in closed systems (e.g. silos, drums or closed raw material bunkers) is to be aimed at. Piled up material or material that is stored openly should be covered or at least kept moist. Particularly in the storage area, it has to be ensured that the work processes are clearly regulated and that corresponding space and the necessary equipment are available for these processes. The procedures are to be planned in such a way that the materials are subjected to as few transportation and process steps as possible. Fine-grained dry bulk materials are frequently stored in silos. In doing so there is the danger that the fine dry bulk materials in the silo are mixed with air during the discharging process due to inadequate design of the flow profile. As a result of this fluidisation there is a high level of dust formation. The entry of air into the dry bulk materials is minimised by the creation of a so-called silo mass flow discharge. In the process, the entire volume of dry bulk materials located in the silo is set in motion at the same time (comparable to a plug-flow). Before con-structing a silo system the respective flow behaviour of the dry bulk goods must therefore be determined. Particularly in the area of storage and transportation of fine-grained dry bulk materials it has to be ensured, as early as the system planning stage, that unnec-essary release of the solid substance (intermixing of the dry bulk materials with air) is avoided. Grain size distribution For a series of production processes the raw materials used, for example alumina and sands, are normally crushed in mechanical processing methods. In doing so it should be ensured that the material is only ground up as fine as necessary. The larger the individual grain diameters, the lower the amount of dust. As a side effect, energy can be saved as a result of the reduced mechanical effort for the crushing. Machining methods Even in the selection of methods for material processing, matters of dust and health protec-tion are to be regarded. When using fast-running machining equipment a lot of fine dust is produced with a very high energy input (fig. 2). The dust particles are not only mechanically accelerated by the machining procedure but gain considerable thermal energy as a result of shear and friction forces. This leads to additional spreading of the particles. For this reason, instead of fast-running, dust-producing machining methods, slow-running and coarse machining methods are to be selected. If this is not possible for reasons of process-technology, wet instead of dry machining methods can be used as an alternative. Before using protective measures that are often technically complex, it is worth checking the application of low-dust materials or of substitutes with a lower hazard potential already at the start of the production process. In some cases this can also be associated with a change to the work method. What at first glance appears to be onerous and difficult can nevertheless be worthwhile: the use of substitutes generally leads to considerable cost savings if, as a result, the costs for extraction and ventilation systems, energy and personal protective equipment are reduced or even made dispensable. the moisture content ("product moisture"). By using moist raw materials or raw materials mixed as slurry the dust formation of dry bulk materials is considerably reduced. Moreover, for slurries or suspensions, after sedimentation of the solid a very high packing density occurs which is difficult to achieve by mechanical pressing procedures. A distinctly reduced storage volume is the consequence. Many manufacturers today offer suitable material suspensions particularly in the area of additives (pigments, glazes, engobes etc.). The less the individual particles in the dry bulk materials are enveloped with air, the less they tend to create dust. By reducing the proportion of air in the material, the formation of a dust-air mixture (aero-suspension) is reduced. In order to achieve this, dusty materials are sometimes provided as pellets or as granulate. If possible these forms of use should be reverted to. Even low quantities of additives can positively influence the relative forces between the particles and thus the development of dust. An example is the addition of stabilisers and pigments in the production of polymeric solids. Top priority even before considerations on the use of low-dust materials, is of course the question for substitute substances: Can toxic dusts or dusts that are hazardous to health be replaced by substances with less dangerous properties? In this case it is necessary to cooperate closely with the suppliers or manufacturers and to examine all technical possibilities. Even for dusty materials this route is onerous and only rewarded with success in rare cases - technology and material properties remain the focus. the silica content in abrasives, in grinding and polishing agents is minimised or even prohibited in some EU member states. Substitute materials are available. 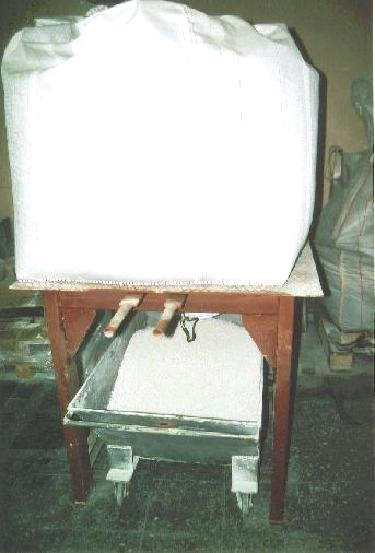 there are also alternatives for silica-containing grit used as firing auxilliaries in the furnaces of the ceramic industry (e.g. corundum). in the majority of cases, glazes containing a high level of lead can be replaced by lead-free or at least lead-reduced glazes. Today, an entire series of substitutes for ceramic fibres classified as carcinogenic is available (details e.g. in the German TRGS 619 [Technical rules for hazardous substances] under www.baua.de). In Europe, the chromate content of cement has been restricted since 2005 to 2 mg/kg in order to prevent the so-called allergic cement eczema. The most effective technical measure for dust control is to work in closed systems (encapsulation, enclosure). The dust-free feeding, processing, emptying and storing of powdery materials, however, presents the highest demands on planners and design engi-neers. Above all, cost-effective solutions must be found for low-maintenance continuous op-eration. The advantages of a closed system for the protection of health, but also for the product quali-ty, are obvious. In closed batch and continuous operation with automatic raw material feed, all substance and process values are recorded consistently using modern IT-supported weighing and control technology. The control of these parameters is a crucial factor for quality and competitiveness. At the starting points and interfaces of production processes where material is introduced ("material feeding"), the danger of releasing dust is particularly great. 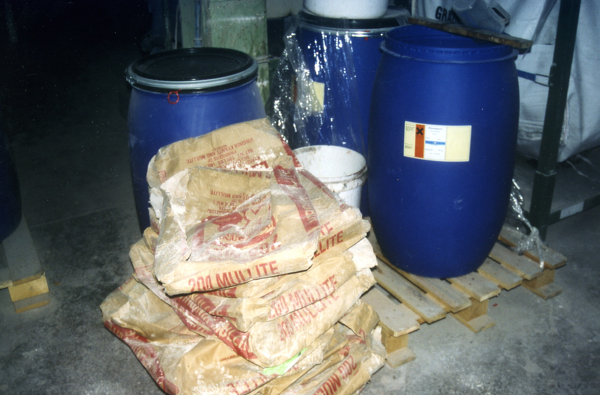 Engobes, glazes and similar raw materials are generally supplied in big bags or paper bags. Pouring out by means of simple feed hoppers no longer conforms to the state of the art! For emptying big bags there are tried and tested easy-to-operate attachment systems (e.g. clamping or inflating collars), which facilitate a dust-tight connection. Via such a dust removal attachment not only can the aspiration air be extracted but also the big bag can be evacuated. Finally it can be removed and disposed of without formation of dust. For dust-free feeding of dry bulk materials from paper bags, bag emptying stations are state of the art. The best variation is a closed system which automatically rips open and empties the bag, compresses the paper wrapping and subsequently dispensing with it in a dust-free manner. Even simpler designs using a bag-supporting table provided with dust extraction and pouring opening considerably reduce the dust exposure and, more-over, stress on the back. An inserted coarse grid prevents parts of the bag falling into the mass when manually slitting the paper bags. Pneumatic conveyors facilitate flexible and sophisticated routing to overcome greater distances (> 30 m) in a closed system. A simple ductwork system with as few internal fit-tings as possible guarantees long maintenance intervals. The use of wear-resistant bends or wear-reducing methods for changing the direction of the material flow ensures a long service life of the system technology. Attention should be paid that the clearance filter for the outflow-ing feed air is regularly maintained. Pneumatic conveyance technology has also been developed for lumpy dry bulk materials, e.g. for coal, coke, slag, shards, lumped lime and wastes. The edge length of the lumps can thereby be up to 40 mm. 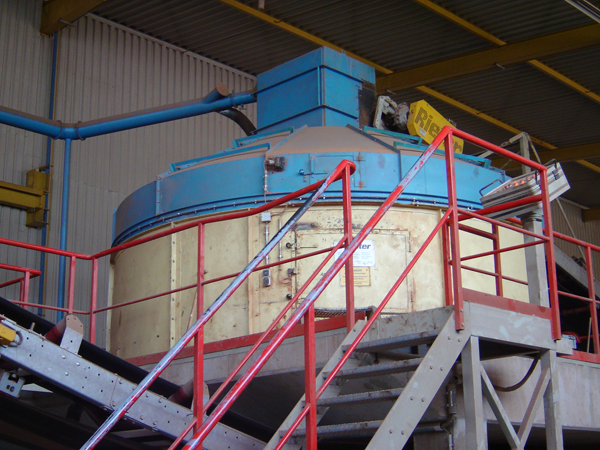 Closed vibratory feeders and screw conveyors are an alternative to pneumatic con-veyance. Using these conveyor systems the material can be transported over limited distances but at the same time can be dosed very accurately. The screw conveyor is suitable for coarse-grained, fine-grained powder or adhesive dry bulk materials that tend to split. For the gentle and low-wear dosing of goods that are susceptible to break and splitting, vibrating dosing feeders should be used. As a result of the vibrating motion, however, grading effects and thus separation can occur. Bucket elevator systems are regarded as being particularly advantageous with regards to dust since they facilitate both vertical and horizontal material transport without transfer points. Since in a bucket elevator system material residues can fall out of the returning buckets, the system is to be additionally equipped with collection devices under-neath. 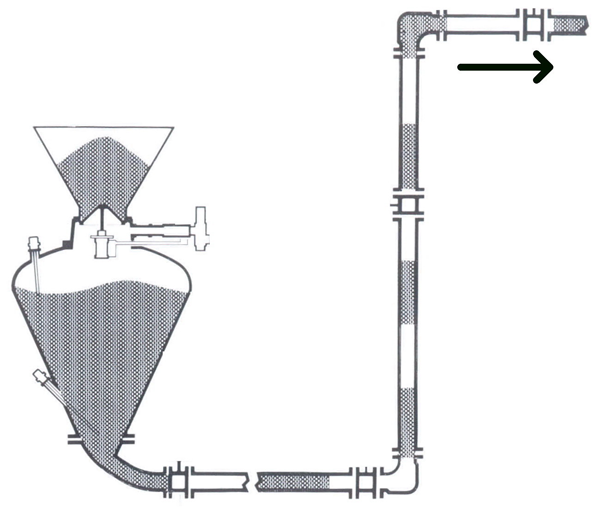 The material that falls out can be collected in a funnel-shaped container and be carried away by means of an extraction system. Negative pressure in the entire conveyor belt area prevents the release of dust as a result of leakages. Transfer points for material at the intersections of the individual system components are to be particularly observed. Encapsu-lation in this area is mandatory for effective dust control (fig. 2). By means of using an enclosure, continuous conveyors can be operated in a virtually dust-free manner. Belt clearance systems (e.g. rotating brushes at the direction change point) are to be encapsulated in a dust-tight manner as well or have to be integrated into an existing enclosure. The principle of encapsulation or enclosure of dust sources not only applies to machines and systems. Also by means of spatial separation of entire plant sections (e.g. material preparation), the spreading of accumulated dust as a result of draughts or plant-internal traffic is prevented. Conveyor belt systems are particularly well suited for being built up in ventilated areas separated from the working space, e.g. in accessible belt channels. 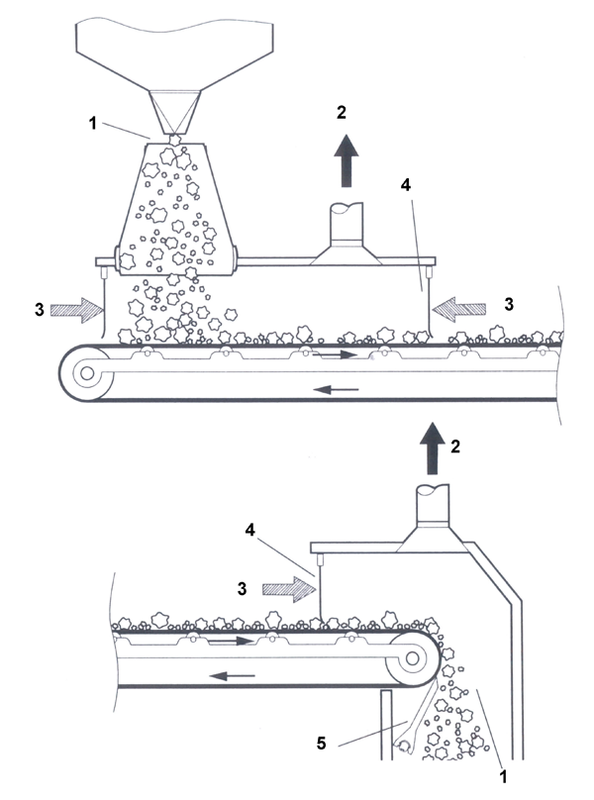 By means of enclosing individual machines or machining steps such as, for example, milling and drilling centres with additional extraction system, the release of dust can be optimally eliminated (fig. 3). Closed installations must be accessible for maintenance and inspection purposes, an ade-quate number of suitable inspection openings therefore has to be provided. Simple sheet metal covers that are kept shut by means of a bracket, for example, are extremely unsuita-ble! In contrast, flanges with a corresponding screw connection facilitate repeated dust-tight sealing. 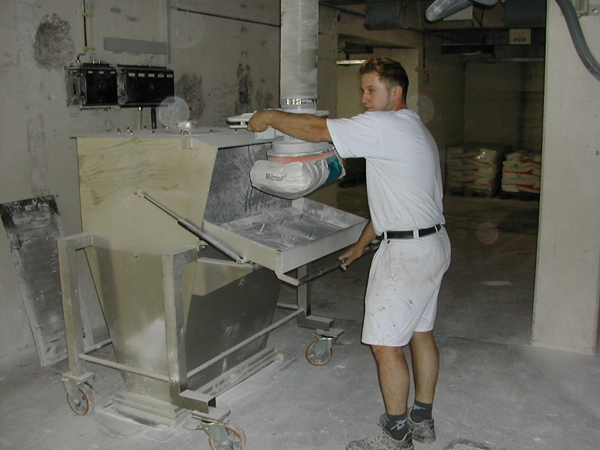 Substitutes, low-dust methods, working in closed systems - often, despite exploiting all po-tentials and the use of the latest technology, dust cannot be prevented from escaping into the air in the workplace. In this case it is particularly important to capture and extract the dusts directly at the point or origin or point of escape, in order to avoid further spreading. The simplest variation of collection systems is collection devices (e.g. bowls, funnels or bags) for escaping or falling wastes. It is generally, however, necessary to exhaust the collection devices and adapt them to the particularities of the dust source. Using a fan, an air flow is generated in the extraction system which carries along the dust particles and supplies them via the intake opening and ductwork to a separator (fig. 1). Es-sential for the good efficiency of the extraction system is the adaptation of the shape of the collection element and its arrangement to the respective type of release and spread of the dust particles. interfering movement of air (e.g. cooling air on electrical motors). Collection systems are fundamentally divided according to the model, into open, semi-open and closed systems. The more open the system, the more problematic the collection of dust. The capturing equipment and the work processes must be coordinated in such a way that they do not interfere with each other. After all, only the dust and not the product should dis-appear into the extraction pipe. A collection element must be designed in such a way that it is easily disassembled, mobile, pivoted or rotated in the event of a change of equipment or product, so that the changeover times are kept to a minimum. As a result of targeted air supply (supply air support) the collection of dust can be considera-bly improved (fig. 2). When designing the system, attention should be paid that the supply air used does not become an interference flow. In some workplaces, for example, when welding, the use of collection systems in closed or semi-open design is often not possible. In such cases the open design has to be used. In order to achieve a comparable degree of collection nonetheless, higher extraction capacities are required since the suction effect very rapidly decreases with growing distance of the outlet opening from the dust source. 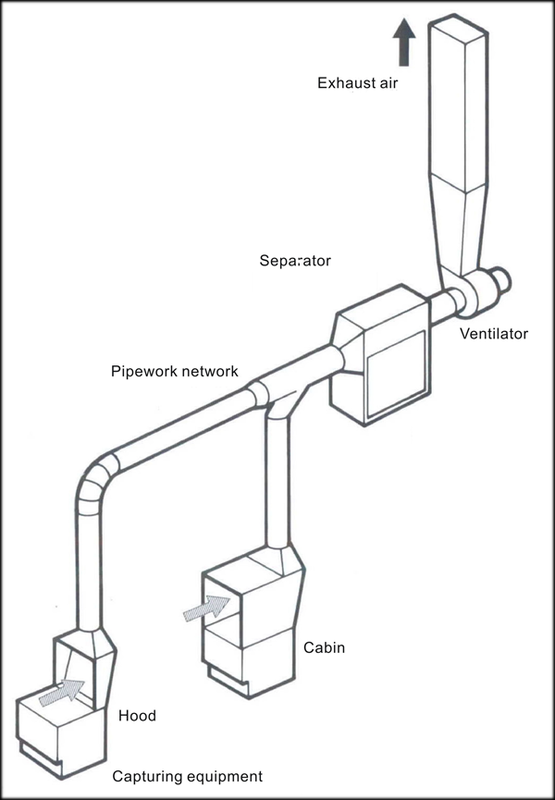 In practice a suction pipe with fitted funnel is frequently used. 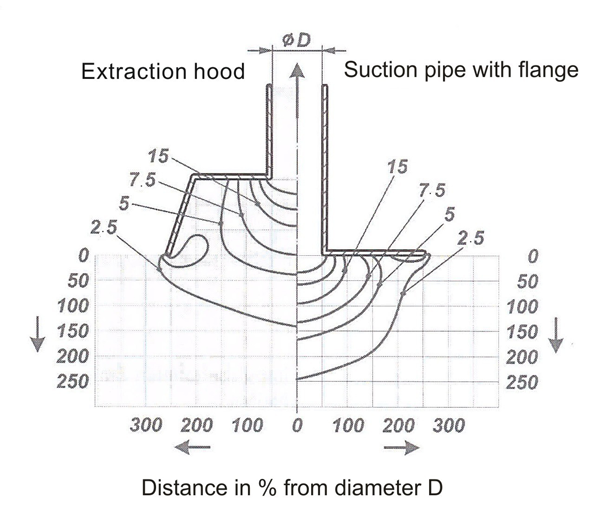 A substantially better degree of efficiency is achieved with a collection element where a flange or nozzle plate is fixed at the end of the suction pipe. In this case, the extraction effect of the air flow is increased by up to 30 % (fig. 3). Even for hand-held machines and tools (e.g. right angle grinders, drill hammers or drilling machines) the industry now offers extraction systems. The dust collection system must be able to be adapted flexibly to the different conditions and nevertheless has to be very stable so that it also withstands extreme site conditions. In addition it should not substantially in-crease the net weight of the machine. If the extracted air is to be fed back to the work space (recirculation of air), it has to be ade-quately cleaned. For carcinogenic dusts, this should only take place using methods or appli-ances that comply with national standards. The recirculated air should approximately reach fresh air quality. This is the case, for example for ventilation systems if the dust concentration in the air that is fed back (return air) does not exceed 1/5 of the occupational exposure limit and the proportion of return air in the supply air is not more than 70 %. For dusts containing silica and in particular for carcinogenic dusts, these values should once again fall distinctly below these figures. In each case, the respective national standards are to be observed. 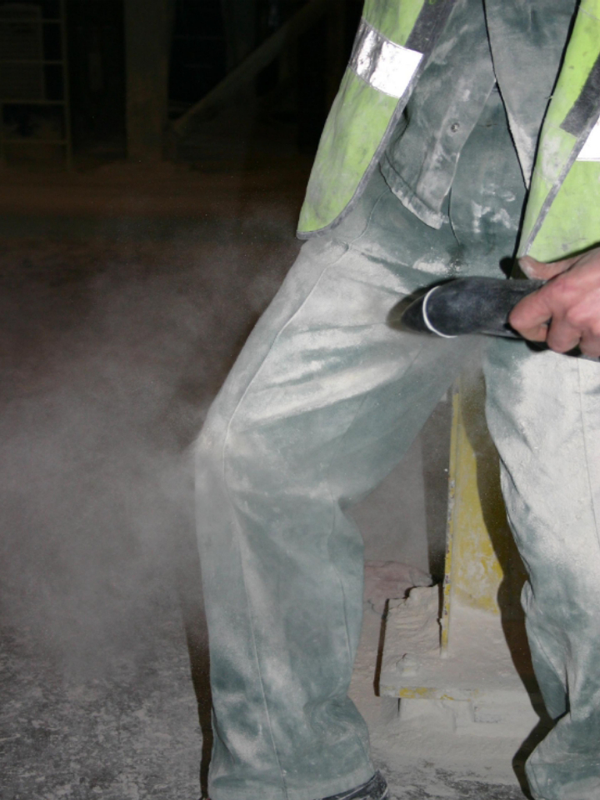 An adequate dust removal effect can be assumed if a type-tested dedusting device is used or testing takes place on site. The system is to be used as intended according to the operating instructions of the manufacturer and the filter material is to be maintained or replaced after the prescribed lifetimes. Mobile small dedusters can be operated with recirculated air if they have a test certificate according to Annex AA of the European standard EN 60335-2-69. They must correspond at least to the dust category "M" (e.g. for lead dust). For carcinogenic dusts the use of dedusters of category "H" is prescribed. For the construction of extraction systems for dust control it is generally recommended that a specialist company is contracted. This applies both to the simple vacuum cleaner and to complex large-scale systems. However this is still no guarantee that the investment effected for a lot of money also conforms to the state of the art! Unfortunately, all too often simple basic rules of ventilation and flow technology are not respected by the experts themselves with the result that the expensive systems do not meet the requirements placed on them. Although, based on simple basic rules and with some technical expertise, it is possible to easily assess the quality of an extraction system. It is important though that these rules are never to be applied in practice alone but always in cooperation. Each extraction task requires a specific combination. Many extraction systems are upgraded step by step over the course of time, in response to the needs of an increasing production. In doing so it must not be forgotten that, with a growing number of extraction points, the fan capacity also needs to be increased accordingly. Even the most modern and most capable exhaust ventilation system will very rapidly loose its efficiency if it is not regularly cleaned and maintained. Here as well the basics of occupational safety apply: Safety, order and cleanliness! In addition it is best practice to establish a maintaining and cleaning schedule in which the concerned system parts, the maintenance, inspection and cleaning intervals and the responsibilities are specified. The system is to be tested for operability in each case before starting work. Prior to the first commissioning, and regularly in at least annual intervals and after major modifications, the exhaust ventilation system is to be tested by a qualified person for sound installation, function and set-up. The source of dust is to be enclosed or encapsulated to the greatest possible extent. In this way the intake of excess air or ambient air and interference as a result of draughts is minimised. Collect dust as close as possible to the source. Collection elements must be introduced as close as possible to the source of emission. Correctly place the collection element, i.e. no employee may remain in the flow of hazardous substance between the source of emission and the collection element. Fully utilise the particular motion of the dust particles. Dust particles sometimes obtain additional kinetic energy (e.g. as a result of fast-running equipment or as a result of thermal currents), which is to be observed in the arrangement of the collection elements. Set an adequate air flow. This always applies if rule no. 2 cannot be optimally implemented. However, it would be incorrect and expensive to simply increase the extraction capacity without taking into consideration the other basic rules. Oversized systems will lead the costs to downright explode! Distribute air speed evenly in the suction zone. In order to extract larger areas with various distances to the dust sources, the principles of fluid engineering are to be observed. Supply an adequate quantity of fresh air. The quantity of air extracted from an area is to be compensated for by a corresponding quantity of supply air so that there is no negative pressure and therefore a loss in power. Avoid draughts. As a result of interfering air flows, for example open windows or workshop gates, the effectiveness of extraction devices can be greatly impaired. Take in non-contaminated fresh air. The supply air in accordance with rule no. 7 may only be taken from non-contaminated areas and conversely exhaust air may not be discharged into the open air within the suction area of the supply air. Despite the possibility of enclosing systems or of extracting the dust directly at the point of origin, it is sometimes not possible to entirely prevent the release of dust. Especially the par-ticularly treacherous respirable dust is not visible to the naked eye and can remain for hours in the air after the end of the work process. Adequate ventilation of the workshops (general ventilation) is therefore essential. The uncleaned air is thereby displaced or diluted by a tar-geted air supply. Fundamentally, a distinction is made between natural and mechanical ven-tilation. Natural ventilation replaces the room air by differences in pressure. The driving forces are wind or temperature differences in the exterior of the building. Natural ventilation is regulated by windows, doors or specific supply and discharge air openings. On the wind-facing site (windward) of buildings excess pressure is formed, on all other exterior surfaces of the building there is a negative pressure. Therefore, the result, depending on the arrangement of openings or leakages of the building, is an inflow of outside air on the side with excess pressure and an outflow of ambient air on the side with negative pressure. Also in this case, the principle applies: without supply air there is no exhaust air! For the air that is discharged from a room, a corresponding amount of air must flow in as replacement, otherwise even the largest exhaust air openings remain ineffective. The supply air must of course not be taken from work areas with dust exposure. Unexpected effects can severely impair natural ventilation. As a result of heated air and due to resulting thermal updraught, unexpected flows and pressure differences are generated within the room. As a result of strong winds or extreme temperatures, the flow of natural ven-tilation can come to a standstill or even change its direction. with substances that possess a low hazard potential. In the process the occurrence of draughts, cooling down and undefined air flows in the room are to be observed. A more targeted ventilation can be accomplished using specific supply and discharge air openings. These must be arranged in such a way that the air flow captures the haz-ardous substances as completely as possible and leads them away via the shortest route. In the planning, all heat sources, all sources of hazardous substances and their indi-vidual movement are to be taken into account. Attention should be paid that the air flow is supported by the existing thermal processes, by, for example, arranging the exhaust air openings as high as possible and the supply air openings as low as possible. The dimensioning is to be undertaken in such a way that an adequate replacement of air can occur even under unfavourable conditions. The cross-section of the ventilation openings should be adjustable, for example using adjustable slats and shutters or using fans and flaps in windows, doors, wall openings, shafts, louvres, domes, lanterns or deflectors. Interference of the existing air flows, for example by moving people or vehicles but also as a result of the opening of doors and gates or as a result of exterior wall temperatures changing with the seasons, is to be taken into account. In the event of high noise levels within the work rooms, noise protection measures are to be provided for the supply and discharge air openings. An optimum adaptation to the specific application, in particular in the event of high level requirements, is achieved using mechanical ventilation. Compared with natural ventilation it is associated with considerable investment and operating costs, it is however independent of the weather. In addition the air flow can be adapted to the spatial conditions and the concentration of hazardous substances. Interfering draughts are thus avoided to the greatest extent. The supply air can be cleaned and conditioned with regards to temperature and moisture, recovery of the heat from the exhaust air is possible. Using dosed high or neg-ative pressure, spreading of the dusts into other work rooms is avoided. In each case the ventilation system must be able to reliably discharge the released dusts. After adequate cleaning the exhaust air can be fed back into the room as recirculated air. It should thus reach virtually fresh air quality (see rule 4), the corresponding occupational ex-posure limits are to be reliably complied with. Most frequently, filtration materials, predominantly fibre filters (fabric, fibre layers) or porous solids (ceramics), are used. In the event of higher dust contents, dedusting filters are used. In the process, the filter cake is detached (dedusted) by shaking, pulsating or by pressurised air surges. A smart variation of workshop ventilation is the creation of spatially separated areas in which the employees carry out certain activities. This also includes, for instance, mechanically-ventilated driver's cabins of cranes or vehicles or control rooms. As a result of being sealed towards the exterior or as a result of over-pressure in the cabin, an overflow of dust particles from the surrounding air is avoided. Normally, the supplied air is cleaned by means of suitable particle filters. arrangement of equipment for air distribution. Even in enclosed plant systems the occasional escape of process or waste material, for example, during maintenance and servicing work cannot be reliably prevented. 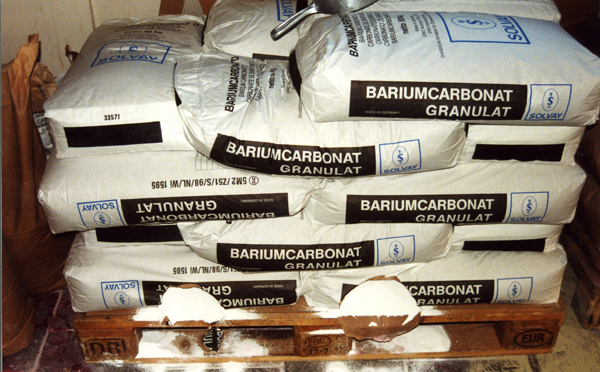 In order to avoid further dispersion and dust formation, it is important to dispose of the escaped substances immediately in a dust-free manner. Even in the planning stage of an operational plant, devices are to be provided which collect falling or escaping material. The collection devices for the waste material must be provided in such a way that they are easily accessible and easy to empty. Since the emptying should take place regularly, the design must be robust and easy to handle. It is to be taken into account that the loads to be moved (collection device + material) are able to be managed by the machine operators. In the event of larger loads, lifting aids are to be provided. The weight of the load that is to be regularly handled should be a maximum of 15 kg. At the emptying point of the collection device measures must be taken to prevent new dusting of the material. In this case, for example, an exhaust ventilation can be installed or the material can be dampened. In some production and manufacturing processes wet or paste-like material is used. When dealing with these forms of use, no dust can be produced - but only as long as the material is damp! In the course of different process steps, for example, when casting slurry or when processing mortar, the damp materials can fall on the ground. These wastes dry very rapidly and can then, with the slightest air movement caused by plant-internal transportation or personnel traffic, reach the breathable air as dust. For this reason particular attention is to be paid that the waste does not fall on the ground at all in the first place, for example by using a collection sack. Technical protective measures, which prevent a dispersion and carrying over of waste material, are to be granted the highest priority. Once material has fallen on the ground it can frequently only be picked up again with a lot of effort. 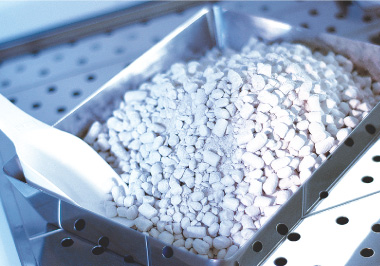 This applies also to raw materials which are provided as granulate, pellets or in tablet form. If the pressed items are spread on the ground there is the danger that they will be crushed by being stepped on or driven over. As a result the substances cover the ground in the finest distribution and can easily be swirled up in the air. For stores with bagged material an impact protector is to be provided. This measure not only prevents the escaping of raw materials which tend to produce dust but also avoids the loss of these materials. For cost-effective and dust-free storing, an impact protector against industrial trucks is therefore essential. Material falling on the ground is to be picked up as quickly as possible to avoid additional formation of dust. Dealing with loose bagged materials places the highest demands on the operators on site. Opening of the bag, the emptying and subsequent folding up of the empty bag are significant potential sources of dust. For the dust-free feeding of bagged materials into silos, vessels or pneumatic conveyor systems the industry provides specific bag emptying stations. These stations now facilitate a virtually dust-free manual introduction of bagged materials into the production process. The emptying station is directly mounted above the feed opening. It has a bag supporting table which is enclosed on three sides. The back wall of the enclosure is attached to an extraction system. The extraction takes place as a result of an attached dust extraction system. Above the feed opening there is a coarse grid which prevents parts of the bag falling into the fill opening. The front wall of the emptying station (bag supporting table) is ideally provided with a flap or door that swivels inwards. If the flap is opened inwards the exhaust ventilation system starts up. At the end of the emptying procedure the flap can be redirected outwards. This leads to a shutdown of the extraction system (energy saving!) and ensures that no impurities are able to reach the feed opening. For low-dust disposal of paper and plastic bags, the use of a so-called empty bag compactor is provided. This can also be combined with the bag emptying station. The compressing process takes place in a closed machine which is attached to an extraction system. The bags are then very heavily compressed in a space-saving manner. A significant portion of dust exposure at the workplace does not directly result from machines and processes but from material that deposits on floors, machines and systems and is swirled up into the air again. For this reason workplaces are to be regularly cleaned. leaning has to take place in a manner producing as little dust as possible. Coarse and in-grained material is picked up by means of scrapers and shovels. If possible cleaning should be wet or damp. For this purpose, smooth walls and floors are necessary. Wooden floors or even carpeting are entirely unsuitable in these areas. As an alternative to soft floor coverings, for example rubber mats are now available. They are ergonomic, noise-absorbing, insulating against the cold and slip-resistant. Textile materials such as curtains or lampshades are dust collectors in these work areas and are therefore to be removed and replaced by smooth materials that can be cleaned wet. For easy cleaning of the walls these must also be as smooth as possible and provided with a water-resistant coating of paint. The rougher the surfaces of the walls, machines and floors, the more dust settles on them and the harder they can be cleaned. To facilitate easy cleaning, the production systems are to be designed in such a way that all areas are easily accessible. So-called "dirt corners" are to be taken into account and avoided as early as at the planning stage or when modifying the system technology. Par-ticularly inspection openings and other system access points such as on filters, are to be designed in such a way that easier access, also when using corresponding aids and equip-ment, is possible. No dry sweeping using a broom! Dry sweeping using a broom is not permitted. A lot of wastes from production and processes occur in a damp state. As long as the waste is still moist, brooms and shovels can be re-garded as suitable aids. However, the material frequently dries within a short time so that when picking up the material with brooms and shovels, dust would be produced. Therefore in any case pick up damp material whilst still in the damp state before it can create dust. As a simple alternative, damp mopping or spraying with water is a good choice. Do not blow off dust deposits! Blowing off dust deposits with pressurised air is strictly not permitted. When blowing off dust with pressurised air, the dust particles are swirled up into the air. Particles that have once been swirled up take several hours before they resettle on the floor or other surfaces. The small particles are so fine that they are virtually invisible to the naked human eye. They thus elude our perception. However, particularly these small particles pass the larynx and bronchia and in this way reach the lungs. The finest particles even reach the pulmonary alveoli. For this reason this fine dust is particularly hazardous to health. Deposits of dust are to be disposed of with moist or wet methods or suction methods using suitable vacuum cleaners or dedusters. Equipment to capture, separate and precipitate dusts must correspond to the state of the art. For the first commissioning, evidence of adequate efficiency is to be produced. The equipment is to be checked for operability, maintained and if necessary serviced at least annually. The checks are to be documented. Mobile or portable industrial vacuum cleaners are recommended for cleaning walls, floors, machines and installations, particularly in tight or difficult to access work areas. For larger surfaces and for cleaning traffic routes, brushing vacuum cleaners are to be used. Dust-eliminating equipments must be tested and classified according to the European standard EN 60335-2-69 Annex AA. Industrial vacuum cleaners, dedusters and brushing vacuum cleaners are divided into three dust categories according to this standard. The cur-rent table of the classification of dust-eliminating machines can be downloaded at www.dguv.de/ifa/de/pra/staubklassen/staubkl.pdf. Mobile dust-eliminating equipment which have a test certificate according to this standard can be operated with recirculated air. For this purpose, they should at least correspond to the dust category "M" (e.g. lead dust or mineral dust). For carcinogenic dusts the use of dust-eliminating equipments of the category "H" is prescribed according to this standard. The selection of the suitable vacuum cleaner has to take place within the scope of specifying protective measures in the risk assessment. For the selection of measures the employer can take over a risk assessment which has been supplied to him by the manufacturer, provided that he carries out his activities according to the details and specifications made there. As a criteria for the selection of an effective system (equipment and deduster), good handling is also to be observed. A good vacuum cleaner has a filter cleaning with automatic vibra-tion, filter bags with low-dust disposal and simple operation and locking devices which prevent the cleaner being operated incorrectly (e.g. if no filter bag is inserted or the filter is overloaded). Only accessories (collection bag, filter medium) that are recom-mended by the manufacturer and which are adjusted to the type of machine according to the details in the operating instructions may be used. 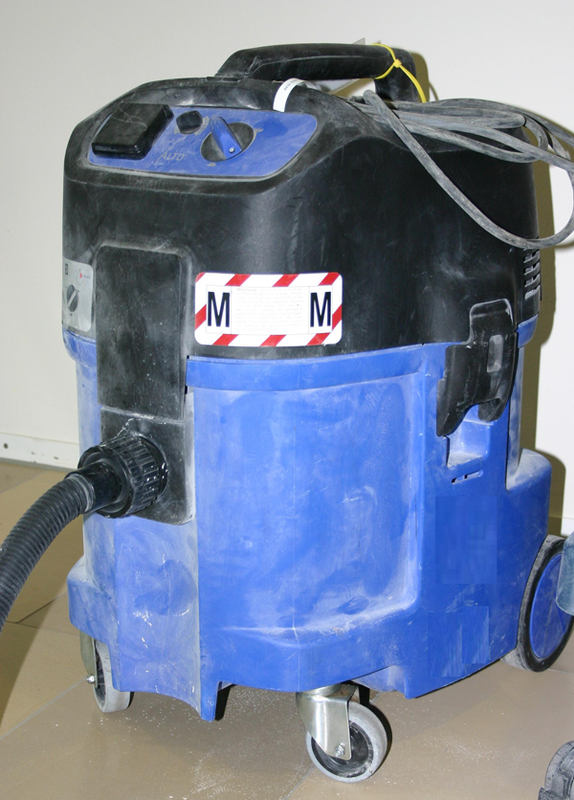 Contact with dusty substances frequently cannot be avoided, particularly in maintenance, servicing and repair work. As a protective measure, at least the wearing of tight work clothes is specified. The clothing gets dirty in the process and for this reason is to be regularly cleaned or to be kept clean. Employees who are exposed to a high level of dirt or dust, inherently feel the need to clean their dusty work clothes. The company wants to prevent canteens, coffee rooms, changing rooms, WCs, the foreman's office, the control room etc. from being contaminated. Privately cleaning dust-contaminated work clothes is inappropriate and for this reason to be avoided if possible. For the company, a contract with a laundry service is an appropri-ate solution! In this case, it is important that the care instructions of the clothing manufac-turer are passed on to the laundry service. There are also service companies which do not only wash work clothes but also hire them out. This solves many logistical problems for the company. The transportation of contaminated work clothes for cleaning should take place in closed vessels. The effect of dust on the respiratory system depends on the dose, i.e. on the concentration in the breathable air and the time during which the dust is inhaled. As a result of the carrying off clothes charged with dust into the private domain and the associated additional exposure, the risk to health increases. These avoidable risks can be counteracted by organising a strict separation between work clothes and private clothes including shoes. In the sim-plest case lockers are used which are divided off by an internal partition. In one half of the cupboard the contaminated clothes are stored and in the other the clean clothes. The basic principles of hygiene already prohibit the contact of contaminated work clothes with clean ones. In the event of very high level contamination or for activities with toxic dusts it is nec-essary to establish so-called black-white areas (i.e. separation of contaminated and non-contaminated areas). In the black area the contaminated clothes are stored and taken in for cleaning. In the black area, ideally showering facilities are provided. The system is only effective if the affected employees use the shower to physically clean themselves. In the connected white area the clean work clothes or the street clothes are put on. In this way, mixing the work and street clothing and the associated contamination can be avoided. Cleaning of the work clothes may only take place by washing. Shaking out or blowing off the dust with pressurised air is not permitted. The consistently discovered pressur-ised air hose for blowing off the dust is prohibited because as a result the dust in-grained in the work clothes is swirled up into the air and then subsequently reaches the breathable air. In addition there is a risk of injury based on the energy of the pressurised air jet. An effective and safe blowing off of dust of the entire work clothes from the shoulder to the shoes can be achieved by using an air-shower cabin. In this process, the entire clothing is blasted in a closed cabin within a few seconds. The dust-containing air is extracted and fil-tered across the floor area of the cabin. The purified return air is then evenly distributed in the ceiling area of the air-shower enclosure and flows in a laminar manner downwards past the person being cleaned. The person can have the dust blown off from the top to the bottom. The blast nozzles are tilted downwards so that the blown off dust is immediately collected and removed downwards. The nozzles are also covered with a perforated plate in such a way that there is a safety clearance between the nozzle outlet and the perforated plate. A risk of injury from the jet of pressurised air thus does not exist. The ventilator for the recirculating air is immediately started upon opening the door so that the recirculating air flows during the entire blasting procedure. For cleaning the soles of the shoes robust strips are mounted underneath the steel grating. For cleaning the uppers of the shoes there is a cleaning brush which is flushed with pressurised air. The use of such an air-shower cabin facilitates a good and safe blowing off of dust of the entire work clothes. The swirling up of dust in the respiratory range of the person is avoided as a result of simultaneous downwards extraction. The air-shower cabin can be used several times during working hours without difficulty. The cabin can be set up both in the building and in outside areas. Order and cleanliness in the workplace starts and ends with clean work clothes. In the planning and construction of new systems installations, attention must be paid that the media necessary for personal hygiene and cleaning such as water, detergents or electrical energy are made available in the correct location. Likewise, discharge flow pipes and the possibility of recycling the cleaning agents must be available. After all, the employees represent the company with their external appearance. It should therefore be a matter of course to provide employees with clean work clothes, to maintain these in a sound condition and to regularly clean them. On the list of measures for dust protection, the use of respiratory protection is right at the bottom. The reason is that before its use, all technical and organisational measures must first be entirely exploited. Generally respiratory protection, for example, in the event of operational disturbances or accidents, must be only worn until the dust exposure is minimised again, or the occupational exposure limits are complied with again. There are, however, also dust-intensive work and activities for which - at least for a limited period - respiratory protection and possible further protective measures is absolutely essential. According to experience during these activities, the dust concentration is so high , that, even if the state of the art is applied, compliance with the occupational exposure limits for dust is not possible. Corresponding examples are cleaning and repair work in confined spaces and within closed systems, work in filter chambers or, for instance, manual demolition work with pneumatic tools. Particularly when manually processing mineral products with modern high performance equipment (e.g. cutting, grinding, milling of construction materials on construction sites), extremely high dust exposure can occur. A list with tested, low-dust machining systems can be found on the website www.gisbau.de/service/sonstiges/staub/staub_bea.htm. If results of dust measurement are already available for comparable activities or workplaces, further workplace measurements do not need to be carried out. Before using personal protective equipment it should be checked once again whether, as a result of limiting the duration of exposure, the dust exposure cannot be significantly reduced for the individual employees. If the hazard assessment yields the result that the substance-related occupational exposure limits (OEL) (e.g. for lead dust) or the OEL for inhalable and respirable dust are not complied with, suitable personal protective equipment is to be provided. This does not just refer to respiratory protection, but also includes closed work clothes, safety glasses and helmet (e.g. for overhead work). The personal protective equipment provided is to be worn by the employees concerned and stored in such a way that it is not contaminated or damaged. Faulty PPE must immediately be replaced. For the use of respiratory protective equipment, attention should be paid to the CE label, which indicates conformance with the applicable standards and thus the fulfilment of the requirements. Generally used are half masks with particle filters, particle-filtration half masks ("dust masks") or fan-assisted respiratory equipment. Normally (for dust exposure up to 10 times the OEL) filtration half masks (FFP2) or half masks with particle filters (category 2) are sufficient. For higher level dust exposure, FFP3 masks or P3 filters, or for extreme dust exposure, full masks with P3 filters are required. The requirements on these masks are described in the European standard EN 149. Do not forget your training! Explanation of the terms "dust", "mineral dust", "silica dust"